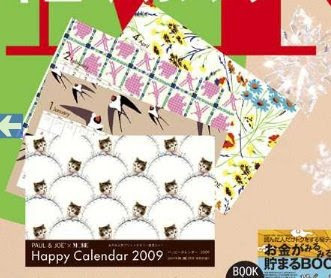 If you're a Paul & Joe fan, you may want to pick up the new January issue of More magazine which comes with a P&J 2009 "Happy Calendar". Check it out here! 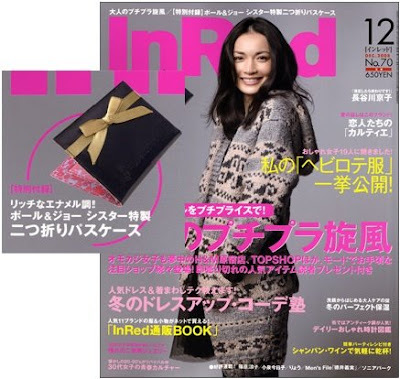 The December issue of InRed magazine also comes with a Paul & Joe Sister pass case. Here's a close-up look at the two new Majolook (Illuminator) palettes, BR799 (left) and BR788 (right). I was hoping for more of a burgundy x silvery taupe combination in BR799 but the middle shade turned out to be more of a taupey grey while the darkest shade is a plummy brown with purple flecks. It looks a bit similar to the Majolook (Trick On) BR751 which came out in the fall collection. BR788 is different enough from the other brown palettes in the Majolook series to justify getting. It has a metallic light beige, antique gold and dark coffee brown. BR762 is the Majolook that I reach for the most often as I like the olive and bronzey brown shades in it. One corner of the store had been done up with MM paraphernalia, probably for the makeover sessions. The displays of the Christmas collection items. 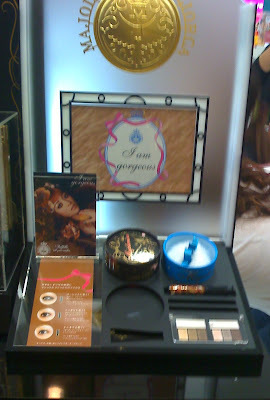 Everything (the powder puffs, palettes, mascara) is priced at S$25.90. I was disappointed to see that the Majolumina powder-in-puffs had only a measly 3g of product inside. 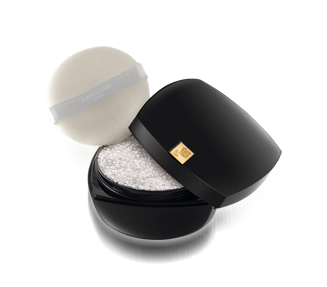 This actually makes it more expensive per gram of shimmer powder compared to the Lancome Diva Magic Powder! I ended up getting both palettes, using the $5 voucher from last week's Gransenbon blush haul (by the way, #7 still has some pieces left so get it while you can because once the stock runs out, it's gone forever. 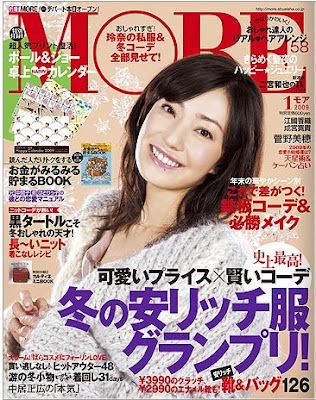 The Singapore distributor apparently took all the remaining stock in Japan). I'll post a more detailed review after I've had a chance to wear these. The Emotional Multiple Eyes are touted as offering two looks in one palette. Here's a diagram showing how the shades can be applied to produce a softer, more natural look versus a more dramatic one. Thanks to a good buddy, I got wind of a Paul & Joe warehouse sale today at Jalan Kilang. We got there just before the 10.30am opening time and already there was a queue. When the gate finally opened, there was a rush to the P&J counter (there was also Givenchy and assorted fragrance brands at the sale). I ended up getting these lovelies for a real bargain! Sparkling Body Powder 001 Ange des Neiges and 002 Sucre D'Orge $18 each. I think these were from a Christmas collection a couple of years ago so I was surprised to see them at the sale. With 10g of product in each, these were really a steal! I also picked up the Intensive Whitening Mask ($26) and the Serum Mask ($31). The only thing that kind of marred the experience is that such sales really bring out the not so pleasant aspects in customers. 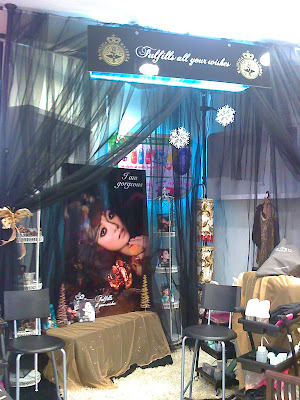 The queue to get to the P&J makeup table was long and slow-moving as some ladies took their time testing a ton of stuff and asking the SAs many questions. I understand the mentality that since they took some time to queue up as well, they did not want to be hurried into making a purchase. But seriously, some were taking 20 minutes or more. I just grabbed the items I wanted and left. All in all, I think many people were frustrated by the messy queues, price discrepancies, items being out of stock but testers still put out, being overcharged or given the wrong items. But I wish people would also spare a thought for the two SAs who had to deal with people expecting the same level of service as a department store counter when they're paying 50% or less of the actual retail price. Why can't people just be more civil and considerate? I found the color combination in the Color Focus Palette #321 Greta Purple ($80) simply irresistible as I like blues and purples. The star print embossed into the surface of the eyeshadows is a lovely touch too. I'd been looking forward to checking out the Diva Magic Powder ($79) after seeing this pic of it online in which it looks like crushed silver pearl powder. This is what the Diva Magic Powder actually looks like in real life! It's not filled to the brim like the promo pic and the powder is much finer and closer to a sparkly white rather than silver in real life. I also picked up the new Maquicake UV Infinite SPF20 PA++ in #40, which I'd been intrigued by ever since I read that you can dunk the whole foundation into water and it will still be dry after you take it out. The texture felt quite smooth but I haven't worn this yet, so I can't say how it performs. This retails for $63 for the refill and $23 for the case. This is also made in Japan. GWP of deluxe skincare and fragrance samples. The GWP also includes a black tote bag. I also received a Color Fever Gloss #160 as my purchase total was over $230. I also picked up Maquillage Dramatical Gel Liner in GY831 and BR652. These are probably the most expensive eye liners I've ever purchased at S$45 each but well worth the cost as the gel is pigmented, easy to apply and much gentler on the delicate eye area compared to pencils. It's also quite easy to draw a fine line especially at the outer corners with the included brush. 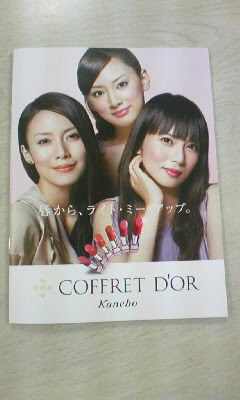 Sneak peeks of the catalogue for the Coffret D'Or Spring '09 collection from 2Channel! 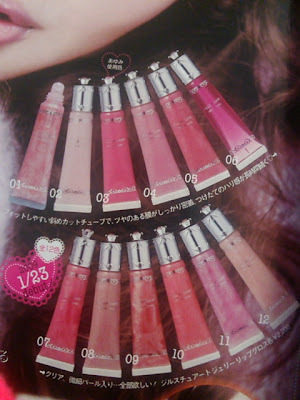 Jill Stuart will release a new lipgloss line, Jelly Lip Gloss (2200yen) in a squeeze tube packaging on 23 January in Japan. Available in 12 shades. These look cute but not particularly outstanding. I'm a big fan of the Mini Bourjois line which makes cute pocket-sized makeup items that are convenient for carrying around on the go. The colours are usually quite fun and interesting too. Best of all, the products are all priced very affordably below 1000yen so you don't feel the pinch when splurging on more than one of these mini babies. 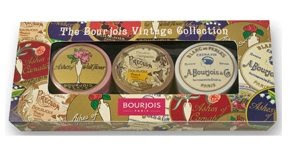 On 27 November, Mini Bourjois will introduce a Baume a Levres (735yen) which is a lip balm in a tin packaging. It contains shea butter, castor oil and vanilla essence. The six shades are #5 Pearly Light Pink, #6 Pearly Pink, #4 Pink BEige, #2 Orange Apricot, #1 Purple Plum and #3 Pure Red. What's caught my eye are the new Mini Blush Cremes (Cheek) (840yen) which are cream blushes with pearl shimmer that transforms into powder upon application. The 8 shades are #1 celeb bronze, #2 healthy golden brown, #3 golden apricot, #4 natural golden peach, #5 sweet gold pink, #6 lilac rose, #7 iridescent rose and #8 ladyish rose. 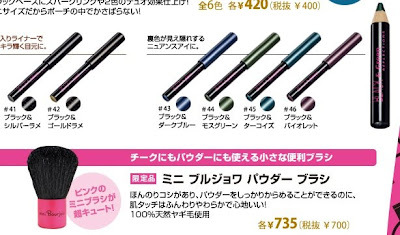 These will be released on 26 December along with 6 new Mini Eyeliners (420yen) and a limited edition pink powder brush (735yen). 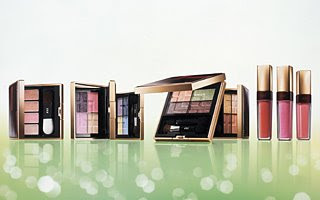 If you're tired of seeing boring browns, pinks, reds and golds in virtually every Christmas makeup collection, then Bourjois may have the perfect collection for you. 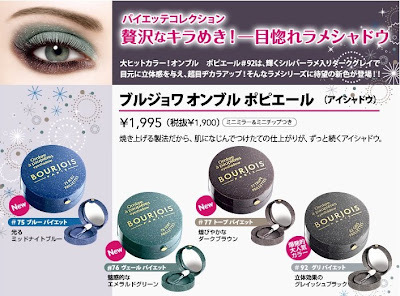 Bourjois is probably one of the few brands in the Japanese markets that regularly offers such rich velvety colors. The four new shades of Ombres a paupieres (1995yen), which are baked eyeshadows, can be used either dry or wet for a more intense and shimmery finish. The new shades are #75 Bleu Paillette (Midnight Blue), #76 Vert Paillette (emerald green), #76 Taupe Paillette (dark brown) and #92 Gris Paillette (greyish black). 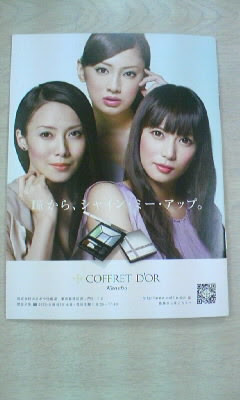 I'm not sure if any of these shades will make it to Singapore as we sometimes get different collections from Japan. So I'm putting these on my shopping list for my Tokyo trip! This is a Vintage Collection Kit that will be sold exclusively at Plaza Style from 6 December. The kit costs 5092yen, which is a savings of about 1000yen compared to if you were to buy the three items individually. 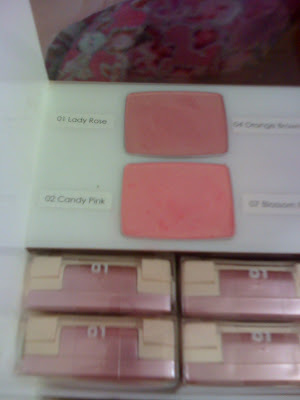 It contains one blush and two eyeshadows. The Vintage Collection will be available in Singapore as I just saw an advert for it at a department store but I can't recall which store exactly, perhaps BHG in Bugis Junction. 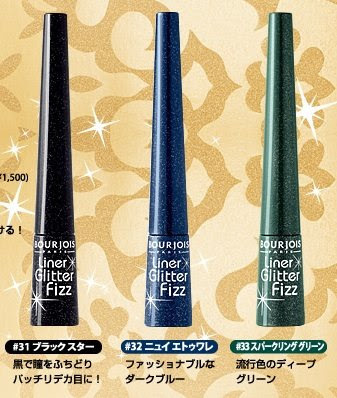 The collection also includes three new liquid eyeliners (1575yen) and a limited edition Gloss Bijoux (2625yen). Majolica Majorca will launch its limited edition Christmas collection exclusively at the Watsons in Ngee Ann City on 28-30 November. The counter will also be doing "Majo-Makeovers" after which you will receive a free Honey Pump Gloss worth $9.90! It's great to see MM launching the Christmas collection only 1 week after the release in Japan but I wonder what happened to the fall collection?! Love Clover will launch a Marshmallow Fit Decoration Powder (2415yen) on 5 December in Japan. 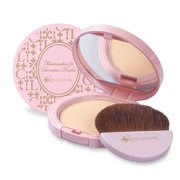 It is an illuminating pressed powder and comes in 2 shades, one with a very fine pearl powder for a glowy effect and another with larger pearl shimmer particles for a more glamorous effect. These are meant to be used on top of foundation and suit all skintones. 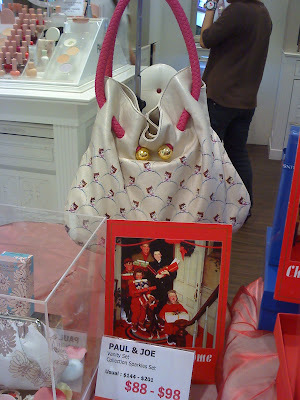 Here's a pic of the new Paul & Joe tote bag featuring the kitty print from the Christmas collection. It's the new GWP with purchases of S$160. But the clunky pink rope handle spoils it! 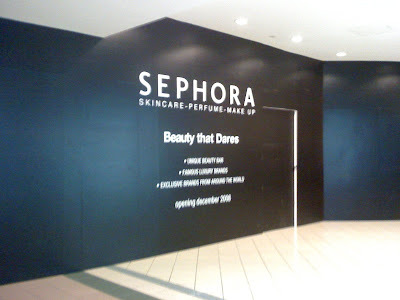 Guess which store is launching in Ngee Ann City this December?! It is on B1, opposite the Harley Davidson store. Hot on the heels of its recent successful launch of Majolica Majorca, Watsons in Ngee Ann City has also launched Gransenbon blushes. The rest of the product line is not available but this is not that big a loss since Gransenbon's best product is probably their blushes. Instead, there is only one cardboard display stand. There are 8 shades available: #1 Lady Rose, #2 Candy Pink, #4 Orange Brown, #7 Blossom Pink, #9 Apricot Ginger, #11 Sugar Marmalade, #12 Peach Rose and #13 Cherry Fromage. #13 was launched just this past fall in Tokyo, along with #14 Maple Nuts but unfortunately #14 has not be brought into Singapore. 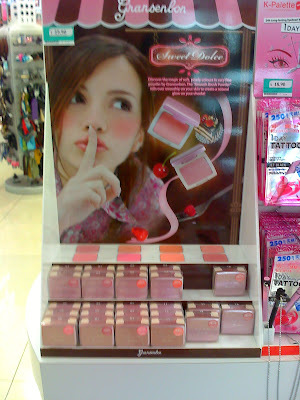 What is interesting is that #7 Blossom Pink, which was earlier discontinued in Tokyo, made it to Singapore! Guess Gransenbon had some extra stocks lying around. Too bad they didn't bring in #6 or #8, which have similarly been discontinued. 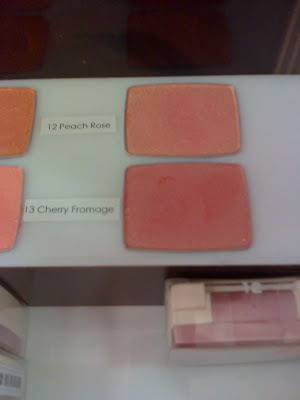 When I was at the store this afternoon, #12 Peach Rose appeared to be the most popular shade as there was only one piece remaining on the display and even that was snapped up while I was there. #13 also seemed to be quite popular with only a couple of pieces left. 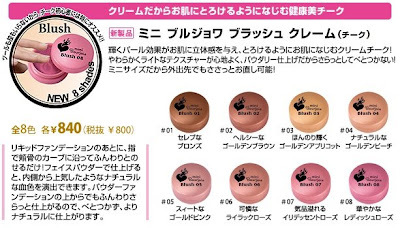 The good news is that the blushes are priced at S$29.90, which compares very well with the 1890yen (about S$29.60) retail price in Japan due to the strength of the yen. Here's hoping that Watsons will keep the price at $29.90, as if it rises, I think many ladies would prefer to get blushes from MAC instead. Watsons is currently also having a promotion whereby you can receive a $5 voucher with purchase of $50 paid by NETS, so now is a good time to buy a couple of these lovely babies. Here's my whole "family" of Gransenbon blushes! I'm missing #3, #6 and #8. 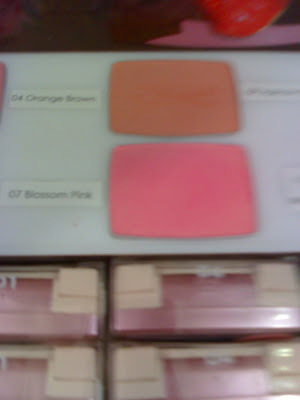 Gransenbon blushes tend to have more shimmer rather than color. This is especially true for their more recent releases like #11, #12 and #13. It takes quite a bit of layering to get the pink tone to show up. If you want a nice baby pink flush, I would recommend #7 which is one of the most pigmented and gives a pretty baby pink flush. 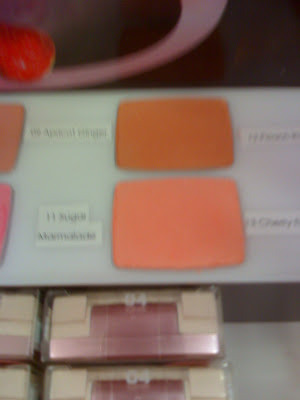 #1, #2 and #4 are the least pigmented of the lot and probably would not show up well except on very fair skin tones. Ingredients list: Ethylhexyl stearate, dimethicone, ethylhexyl palmitate, methyparaben, sorbitan isostearate, tocopherol, jojoba seed oil, matricaria flower extract, butylene glycol, water, rosemary leaf extract, mica, aluminum distearate, carnauba wax, silica, talc, methicone, nylon-12, CI73360, iron oxides, ultramarines, titanium dioxide.